Handmade fabric fully lined wristlet with zipper closure. Approximately 8 inches by 5 inches. Perfect for traveling, the beach, amusement parks or evenings. Can be used to hold sunglasses, cosmetics, identification and credit cards, cellphone and accessories or feminine hygiene products. 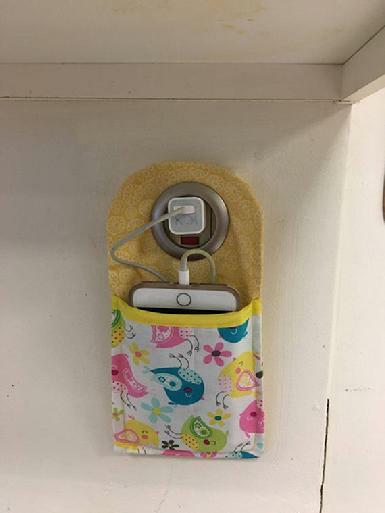 This fabric cell phone Charging Station or Docking station will help you to keep your phone safe and clean when charging. It has a interfacing for stability. Good for using at the airports, hotel rooms and at home, keeping your phone easy to find. 11 x 5 inches. fits all size of cell phones.The plastic grommet is 1 9/16".